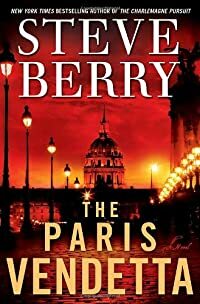 The Paris Vendetta by Steve Berry, a Mysterious Review. Review: Cotton Malone is back in The Paris Vendetta, the fifth book in this series by bestselling author Steve Berry. Cotton is a retired police operative with the U.S. Justice Department, and he is brought into the middle of mayhem when Sam Collins, an American Secret Service agent, breaks into his peaceful bookstore demanding help. Why would Cotton help a stranger? It's simple – Henrik Thorvaldsen asked. Malone is at first thrown into the middle of a vendetta in which his good friend, Henrik is avenging the murder of his son, Cai. He has eliminated two of the murderers, but he is seeking the man who planned the conspiracy that ended his son's life – Lord Ashby. However, Sam's interest is different. He's hopped upon a conspiracy in which Eliza Larocque is planning on making billions through wreaking havoc on different societies in the form of conflict such as terrorism. Eliza is also involved in her own vendetta in which she is seeking Napoleon's lost treasure to "rightfully" claim as her own. She has formed a Paris Club in which the investors are sure to turn their 2 million euro investment into billions. Sam has gone against his authorities to investigate this club – and who at the heart of Eliza's club and vendetta? – Lord Ashby! Once Malone is in Europe he finds that there is more to the situation than he originally knew. Stephanie Nelle, Malone's former boss, appears unexpectedly to inform him of a situation of even greater consequence. The U.S. Justice Department is closing in on the abduction of one of the world's most wanted men – Peter Lyon, and the informant working with the Justice Department is none other than Lord Ashby. Malone is put in a horrible situation of conflicting loyalties. As the past collides with the present, and friend collides with foe, Cotton Malone must make the hardest decisions of his life all the while weighing the price of success. The Paris Vendetta is a gripping novel, and Steve Berry is an expert at character development. Cotton Malone is a force to be reckoned with. He challenges authority, takes risks no one else would dare, and maintains a wry sense of humor! "Foddrell was nowhere to be seen, but Tweedledum and Tweedledee were headed toward the next exhibit space." His pet names for people he's chasing are great comedic relief during an otherwise in-depth, action-packed story! The secondary characters are also so well developed and all completely unique. Berry provides back stories that are eloquently done in such a way that the story and characters are enhanced. So many authors use back stories as page fillers, but Steve Berry weaves them so acutely into the character's persona that the reader comes to legitimately care for the characters. The plot development is also well done, although it is somewhat confusing at times. The reader comes to the novel with the understanding of Eliza's family vendetta against Napoleon. But, there is so much more to this novel. The layers of one story line over another, vendetta on top of vendetta, is done with such precision. However, Eliza's economic plans are confusing at best. Even her Paris Club members are confused in the book – seeking for more clarity of how their millions will turn into billions. The idea is fascinating, and there are a lot of parallels to the modern world which are indeed frightening, however, it is unclear how she would carry this out if given the chance, causing the entire proposal to lose some of its validity. Nonetheless, aside from a few quirks here and there, The Paris Vendetta is an excellent read – filled with action, suspense, tragedy, and humor, along with an in-depth story line that will keep readers thinking long after it's finished. Special thanks to guest reviewer Margo Nauert for contributing her review of The Paris Vendetta. Acknowledgment: Meryl L. Moss Media Relations provided a copy of The Paris Vendetta for this review.